ADF&G is working with the Alaska State Troopers' Bureau of Wildlife Enforcement to step up prosecution of people who illegally stock fish. The Alaska Board of Fisheries also relaxed Southcentral pike fishing regulations by allowing anglers to keep all the pike they catch, and by allowing additional gear, such as spears and bowfishing. Increase public awareness of the problems with invasive pike. Gain public support for management actions. Use scientifically sound management options to control or eradicate pike in Southcentral waters. Improve wild salmon and trout populations that have been reduced by pike. Resume the stocking of those waters that are no longer stocked because of pike. This plan was developed through USFWS Nuisance Species Program funding and follows protocols for species-specific management plans established by the Aquatic Nuisance Species Task Force. The Department is removing invasive pike through gillnetting and other methods. These projects tend to be labor-intensive and must be repeated regularly to be effective. 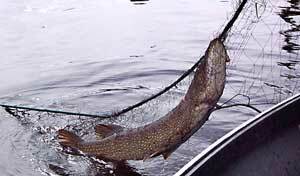 Netting does not usually eliminate pike completely. Young pike are most often found in very weedy areas, where fishing gear and nets are difficult to use, and pike must be moving to encounter the nets. Because pike are pretty sedentary when not spawning or feeding, catching all pike in a waterbody is unlikely. Still, there are cases where intensive gillnetting programs are the Department's best option for keeping invasive pike populations in check. For example, an large-scale invasive pike suppression program takes place annually in Alexander Creek in the Susitna River drainage. Some of the worst declines in salmon populations from pike predation have occurred in Alexander Creek, and ADF&G is trying to increase salmon productivity in this system through this effort. Gillnetting for pike is labor-intensive and does not usually remove all pike in a system, but in places like Alexander Creek, where the pike habitat is too extensive to for effective eradication, it's the Department's best defense for keeping the pike populations in check. 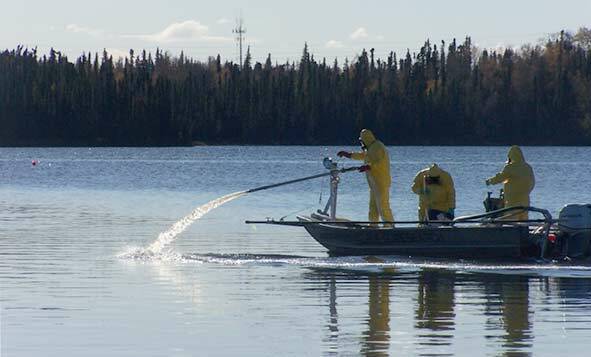 Applying a fish pesticide, such as rotenone. Draining an entire lake may not be a realistic option for many lakes. Inlet and outlet streams have to be blocked or diverted. People with property around the lake are often very concerned about actions that raise or lower the water levels. In addition, the many required permits and processes greatly raise the expense and difficulty of draining the lakes that have illegally-introduced pike. Rotenone, however, has been successfully used in fisheries management since the 1930s. Rotenone is a naturally-derived piscicide (fish pesticide) that has undergone rigorous review by the U.S. Environmental Protection Agency. It has been concluded that rotenone does not negatively affect human health or the environment in the concentrations used for fisheries management. Still, the Department realizes there may be some concern about rotenone, and the Department is aware of those concerns. If rotenone is determined to be the best tool for removing invasive northern pike, the Department will fully engage the public decision-making process. Rotenone applications can be very effective in removing all northern pike in a population.